As a Manchester, NH advertising agency for small to mid-sized business, we love creating sophisticated advertising that stops you in your tracks with their eloquence and creativity. But we also understand that a lot more goes into a great advertising campaign than a glitzy graphic or clever headline. We know from experience that the success of your advertising hinges on first developing a strong understanding of your market and offerings. Only then do we begin to shape the message and graphics to support it through a strong marketing strategy. Companies in New Hampshire, Massachusetts and beyond have been benefitting from our advertising agency since 1999. One look at our advertising portfolio and you’ll understand why. "Mom says I can't have soy, gluten or wheat. Eggs nuts and dairy, I also can't eat. 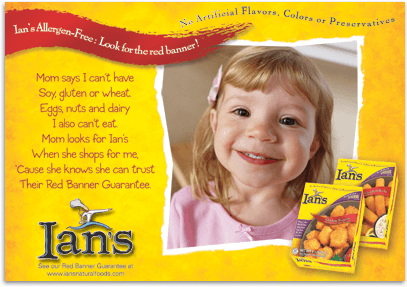 Mom looks for Ian's when she shops for me, 'Cause she knows she can trust Their Red Banner Guarantee."